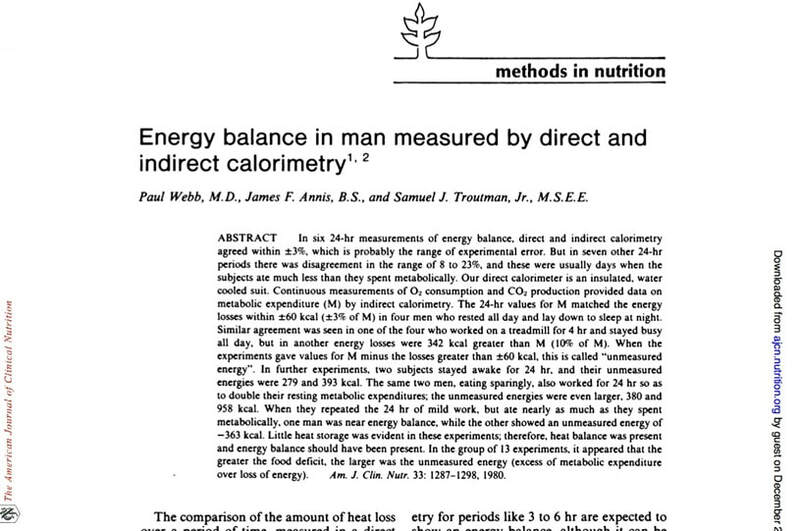 From 1972 on, Dr. Paul Webb, a specialist in calorimetry and metabolic research, conducted with his research team a series of scientifc studies trying to replicate the experiments of Atwater and Benedict with improved calorimeters. 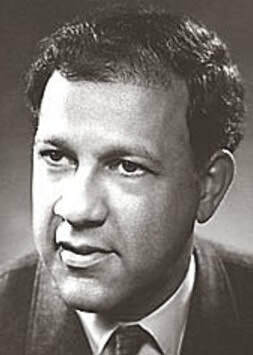 Dr. Webb worked especially in the field of aerospace medicine and in the 1960s developed for the NASA a new suit calorimeter that allowed measurements on a whole new level, and that questioned the universal validity of Calorie Theory in the human body on a fundamental basis. 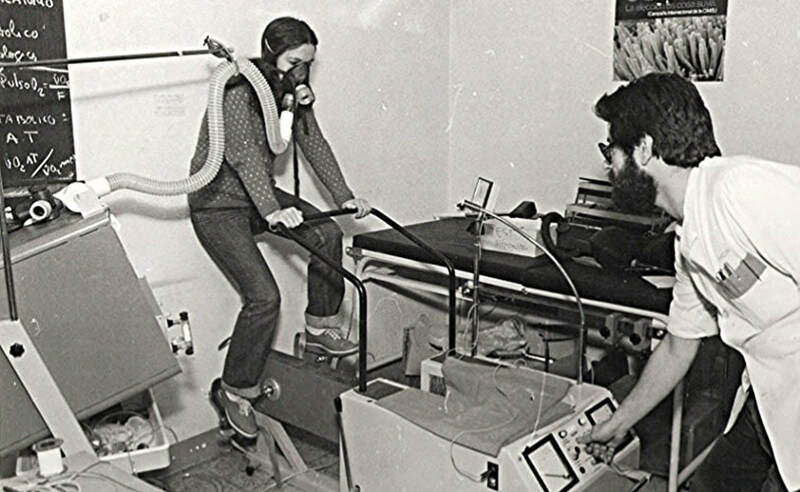 The revolutionary results, which were published in 1980 in the renowned, peer-reviewed American Journal of Clinical Nutrition, pointed to a crucial discrepancy between the theoretical amount of energy produced by metabolism (the results of indirect calorimetry measuring the consumption of oxygen and production of carbon dioxide) and the actual measurable (by direct calorimetry) amount of energy produced by the body. This discrepency was up to 23 percent, the so called "unmeasured energy", meaning that in some cases for nearly a quarter of the energy produced in the test persons, the scientists had no explanation at all. And the study states: "The greater the food deficit, the larger was the unmeasured energy". Dr. Paul Webb, a specialist in metabolic research, developed for the NASA a revolutionary suit calorimeter that allowed measurements of the human energy balance on a new level - with groundbreaking results. And: "The greater the food deficit, the larger was the unmeasured energy". The results were so groundbreaking, that Dr. Webb started to look at other studies concerning the same subject. Beginning with the work of Atwater and Benedict, in all, he found fifty-two studies comparing direct and indirect calorimetry which were applicable to his inquiry. What he found confirmed the results of his own laboratory work. He wrote: "The more careful the study, the more clearly there is evidence of energy not accounted for." Faced with this evidence of "energy not accounted for," the author felt that it was necessary to introduce a new term into the calculation of energy balance. He used the term Qx - Energy coming from an unknown source, or "Energy out of nothing". ​Although the findings of Dr. Webb will probably need a few more decades to change the Western scientific understanding of the human body and the vital energy - the Eastern medical traditions are well aware of this mysterious Qx energy - they just have different names for it. 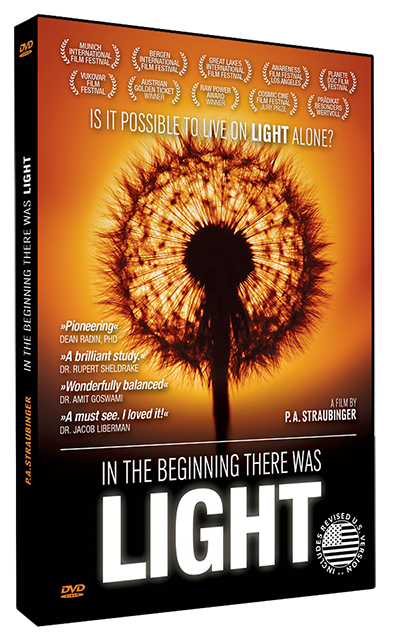 In China they call it Qi, in India Prana, Wilhelm Reich called it Orgone and - who knows - perhaps even the mysterious, undetectable Dark Energy, that permeates the whole universe, has something to do with it. 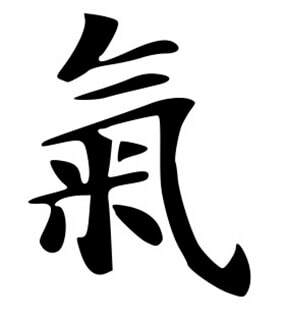 What the study calls "energy not accounted for", Qx or "unmeasurable energy", could be connected to the energy that is called Qi by the Chinese or Prana in the Indian Tradition. ​Since 1998 mainstream science accepts that only 4.9 percent of the known universe consist of ordinary energy and matter. 26.8 percent consist of Dark Matter and an incredible 68.3 percent consist of Dark Energy. 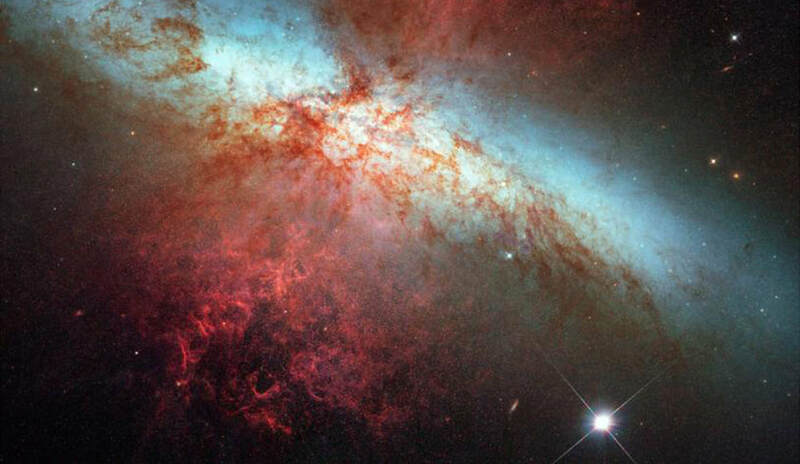 Dark Energy is an invisible and undetectable energy that permeates the whole cosmos and so all our cells. Is it possibly connected to the "unmeasurable energy" that also sustains our body ?